A legend during the Jet and Rocket car Warz of the 70's, 80's, 90's and up to the mid 00's of this 300 mph Jet Dragster is now a respected and successful businessman in Phoenix, Arizona. While a tough driver to compete against. It is as significant, that Al is a showman and always the one eager to entertain. Past exploits have all focused upon Al’s 30 + years as a touring professional Drag Racer. 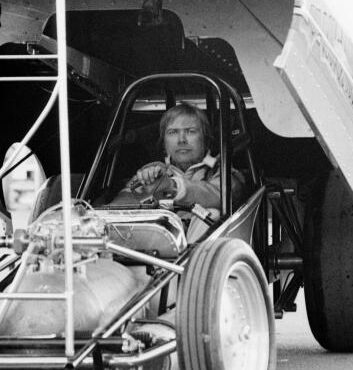 Al has raced everything from Super Stock, to Top Fuel in the late 60’s and early 70’s. During Al's driving career, while traveling across the nation He performed an average of 60-65 events in the early years and later on slowed down to spend time with his 3 boys. His first jet dragster, Emergency 1, was stylized after a fire truck and was powered by a Westinghouse J-34 jet engine. This vehicle although very popular was retired to make way for the next generation jet vehicle, The Invader. The Original Invader also was a J-34 powered beast, breaking track records where ever she ran. Into the mid 80’s, looking for a new challenge, Al teamed up with long time friend, Slammin Sammy Miller to drive his Vanishing Point Rocket Funny Car. Sammy & Al performed the very first side by side rocket car races at Santa Pod Raceway in England. Both cars running in the low 4 second range over 350 MPH. With most of the drag racing challenges behind him, Al then decided to train and consult the new and upcoming jet car drivers and owners on how to successfully operate. During this time, Al trained numerous drivers, and operated numerous teams ranging from jet dragsters, jet funny cars, and even the restoration of some of the original jet cars & jet powered boats. Al’s three sons eventually persuaded him to again field his own car, and the second Invader was born. After successfully running the Invader for the first few seasons, Al stepped back from the driving duties, and spends most of his focus on training his sons in all aspects of the running of the team. Currently, his sons Curt and Craig are licensed NHRA/IHRA drivers and Chris is actively working his way to do the same thing, giving Chris a little extra leeway to do his job representing a key supplier to the aerospace industry worldwide.